Earlier this year, I wrote about the 100th anniversary of the signing of the International Convention for the Safety of Life at Sea, or SOLAS, first adopted in January 1914, and inspired by the 1912 sinking of the RMS Titanic. Life at sea is indeed immeasurably safer since the passage of SOLAS. But international treaties like SOLAS and legislation at the national level are never instant, or complete, fixes. In fact, in May 1914, just months after SOLAS was first signed, the Norwegian ship SS Storstad came out of heavy fog to collide with the RMS Empress of Ireland (“Canada’s Titanic”) on the St. Lawrence River. About 14 minutes later, the Empress of Ireland sank, taking more than 1,000 lives. I invite those who aren’t familiar with the Empress of Ireland accident to research it further. But the stark fact is that the 100th anniversary year of SOLAS also included the 100th anniversary of another marine tragedy rivaling the sinking of the Titanic. A new treaty, or law, or technological advance is never enough. Layers of safety have to interleave to protect the lives of mariners and passengers at sea. There are international treaties, national laws, and industry standards, and improving each of them improves safety. But safety depends just as much on people and procedures, all the way down to individual actions. November 29, 2014: At 4:17 a.m. PST, west of Siletz Bay, OR, the Commercial Fishing Vessel Blazer took on water and sank. Five people were rescued by the United States Coast Guard (USCG). Minor injuries were reported. December 1, 2014: At 7:23 a.m. CST, south of Port Fourchon, LA, the Commercial Fishing Vessel Miss Eva caught fire. Three on board were injured, one seriously. December 4, 2014: At 2:42 a.m. EST, in Eastport, ME, the Eastport Port Authority Breakwater Terminal Pier collapsed, completely submerging three vessels and breaking others free of their moorings, obstructing the entrance to the harbor. December 5, 2014: at 2:16 a.m. PST, the 171 gross ton Commercial Fishing Vessel Titan reported that it had run aground and was taking on water at the “A” Jetty in Ilwaco Channel, WA. The USCG responded and attempted, unsuccessfully, to help the 5-member crew to dewater the vessel. The crew was subsequently evacuated on a USCG motor life boat. The Titan slowly sank, releasing some of the 3,500 gallons of diesel fuel onboard. 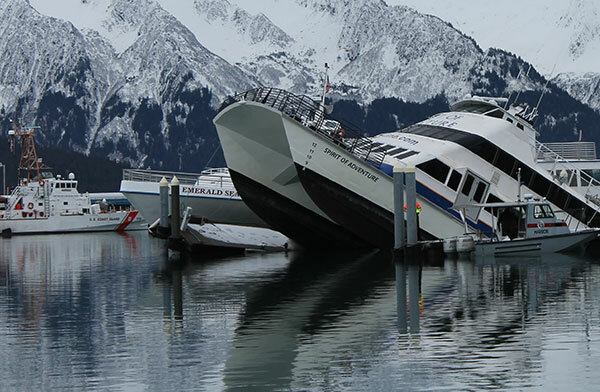 December 8, 2014: At 9 a.m. AKST, the 99 gross-ton Passenger Vessel Spirit of Adventure was found partially submerged at the dock in Seward Harbor, AK. No crew or passengers were on board at the time of the incident. Damage is estimated at $1 million. Our investigative work on each of these events has just begun, and it may be months before their lessons are fully learned. But there will be lessons. If the lessons are applied, the circumstances leading to these accidents and incidents can be prevented in the future. While some suffered injuries in these five events, we will have learned these lessons without loss of life. They will be bargains, so to speak, in the world of marine accident investigation. I invite readers to read our brief digest of completed marine investigations, Safer Seas 2013. In 2015 we will publish Safer Seas 2014, to share the lessons of investigative activities completed this year. We urge all those who take to the seas – and all who are involved in marine enterprises – to review these lessons. Countless lives have been saved by SOLAS, national laws, improving industry standards, and better technology. More will be saved by addressing the lessons we learn in future investigations – and by individual mariners taking to heart the lessons already learned. In December 1944, delegates from 54 nations gathered in the Grand Ballroom of the Stevens Hotel in Chicago at the invitation of the United States of America. And today, it was an honor to be in that same place celebrating the ICAO successes. In 1944, those nations had a vision of a safe and orderly international civil aviation system that would foster friendship, understanding, and cooperation and signed the Convention on International Civil Aviation, also known as the “Chicago Convention.” Fifty-two nations signed the Convention, establishing the International Civil Aviation Organization (ICAO) as a specialized agency of the United Nations. The aviation industry is an international business, where aircraft carrying passengers and cargo crisscross the globe and has greatly benefitted from its establishment. 70 years later, ICAO and the global air transport community came together to commemorate this moment in aviation history. I was pleased to be with ICAO Secretary General Raymond Benjamin; US Secretary of Transportation, The Honorable Anthony Foxx; the FAA Administrator, the Honorable Michael P. Huerta; the Honorable Rahm Emanuel, Mayor of Chicago, as well as the Secretary General of the United Nations, Ban Ki-moon to mark this momentous occasion. During the meeting, a Special Resolution paying tribute to the Chicago Convention’s contributions to global peace and prosperity through the safe and orderly development of international civil aviation was passed. For more than 40 years, the NTSB has participated in ICAO working groups that have shaped aviation safety. We have worked with our international counterparts to improve aircraft operations and maintenance for civil aviation, to create an international standard for supporting the families of those affected by an aviation accident, and to improve how we work together to investigate aviation accidents. In the U.S., flying on a commercial jetliner has never been safer, but it’s not risk-free. We must continue to look for ways to improve safety, including working with our foreign partners. International cooperation drives further safety improvements to U.S. products and services and encourages reciprocal support from our foreign partners when foreign equipment or foreign carriers are involved in accidents in the U.S. Only by working together can we ensure that the traveling public arrives at their final destination safely.